Challenger Lifts’ 9,000 lbs. capacity CL4P9X and CL4P9W 4-post home car lifts are perfect for light duty commercial service or storage applications. Bolt it down or leave it free-standing so you can relocate it anywhere. Challenger Lifts 9,000 lbs. 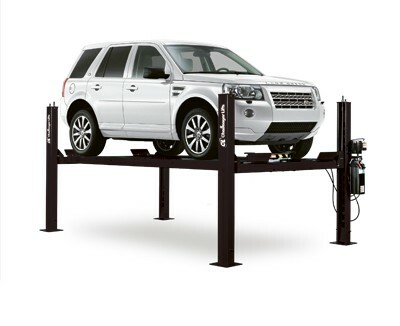 home car lift and commercial service lift units give you unlimited options for your shop’s layout. With optional rolling jacks, ramp upgrades, oil drain pan, etc., you’ll be able to accommodate just about anything that comes in the garage and afford room to grow with its reasonable cost. Challenger’s 9,000 lb. capacity CL4P9S, CL4P9X and CL4P9W are perfect for home garage and commercial storage and light duty general service applications. Bolt it down or leave it free standing so you can relocate it anywhere. With extended length and width models, these service and home storage units provide unlimited options for the DIY car enthusiast. Multiple Power Unit Locations. The power unit can be placed either on the front column of the drivers side or the back column of the passenger side of the lift. This provides convenient power control accessibility and versatility for any garage layout. With optional rolling jacks, ramp upgrades, oil drain pan, etc., you’ll be able to accommodate just about anything that comes in your garage and afford room to grow with its reasonable cost. Available in black only.